So this week one of my biggest dreams has actually came true. I was able to not only be an assistent in the backstage of one of the fashion shows of the Milan Fashion Week, I even had the chance to be in the venue and watch the actual show. I know it sounds crazy but I promise you it actually has happened. Now, you are probably wondering what in the world I was doing at a fashion show in Milan, because let’s be honest, I am not a famous fashion blogger who get’s to be invitated at fashion shows, nor a celebrity. Basically one of my friends, who works for a fashion company in Milan, needed an assistent to bring the models to hair and make-up and to make sure they were ready on time for the show. You can imagine my reaction when she asked me to be her assistant at the Francesco Scognamiglio Fashion show. My jaw dropped open. I could not believe it. But I immediately took the chance. Something like this doesn’t happen everyday, so I was more than thrilled to get to go. It was my first time at a fashion show, and I loved every single second of it. 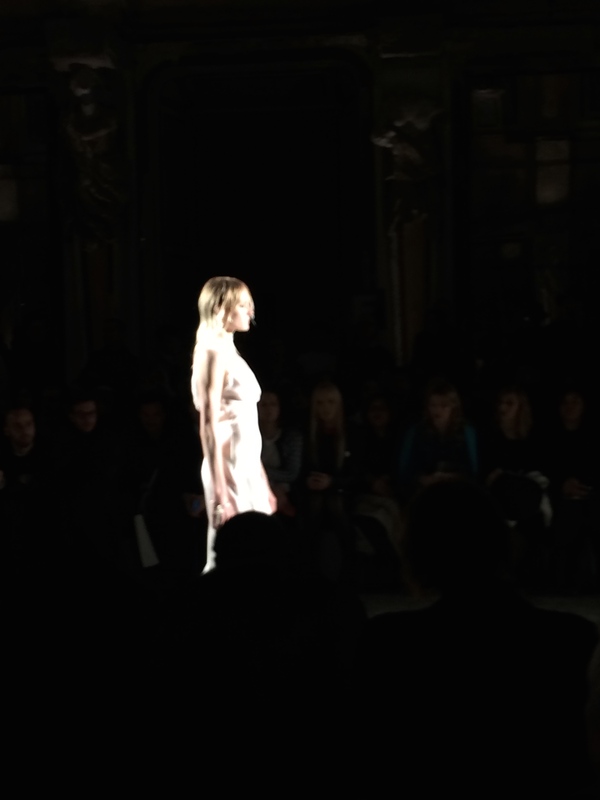 The show took place at Palazzo Reale in Piazza Duomo in Milan. I got to the location at 4.00 pm and I was escorted backstage ( it sounds so funny because a bodyguard litterally escorted me in the backstage) where I got to meet the hairdresser for the show, Paolo Soffiatti, and his crew. They were sponsored by L’Oréal and were using a lot of products that I love, like the L’Oréal Elnett Satin Hairspray and Gel. Later on, the makeup artists started to come in. I honestly have never heard of the make-up brand they were using, so I can’t really tell you much about it, except that it was called Lord&Berry. The head make-up artist was Georgina Graham. For the look of the models the designer decided to keep things very simple, in order to focus the attention of the public completely on the dresses. For the hair they decided to have the “I just got out of the shower” look. They used a lot of hairspray on top of the models’ hair to keep them sleek and pulled back, and left the ends flowy and shiny. For the make-up, they focused on the lower lash line using a black eye liner pencil, pink cheeks and very natural skin. I was given a list of the models’ names and I had to check their names as they were coming in, take them to hair and make-up, and when they were done, I had to take them to the dressing room. I have to be honest, I thought that some of them were going to be rude or self-centered, but I was totally wrong. They kept smiling at me, and some of them were even cute enough to have a chat with me and make some funny jokes. There was one model that I particularly loved. Her name was Vanessa Moody, she was extremely polite to me. She kept smiling at me, and when I asked her to take a picture with me she kindly agreed. So thank you Vanessa, you made my day. At 8.30 pm it was finally show time. The music was almost enchanting. As the models were walking the runway their dresses were flowing and looked amazing in the flash lights. I was mesmerized by how this girls walk. They make it seem soo easy, but I’m sure it’s not. Their heels were soo high I would have fallen at the first step. I hope you guys enjoyed reading about my experience at the Fashion Show. Here are some pictures I took in the backstage and of the show. If you want to watch some videos I uploaded them on my instagram, so you can check them out @_francesca_greco_ or @thehotmessblog. Congrats! I passed by Milan for the Man fashion week and the atmosphere was brisky and international!